Singles and Pairs: A basic spin position with the free leg backwards with the knee higher than the hip level, however Layback and Biellmann are still considered as upright positions. Ice Dance: Performed on one foot with skating leg straight or slightly bent and body bent forward and free leg extended or bent upward on a horizontal line or higher. Singles and Pairs: A basic spin position with the upper part of the skating leg at least parallel to the ice. Ice Dance: A basic spin position performed on one foot with skating leg bent in a one-legged crouch position and free leg forward, to the side or back. Many thanks to the contributors of previous evaluator/judge training manuals. Welcome to the STAR 1-4 judge seminar. Skate Canada is very pleased that you have chosen to pursue officiating as an extension of your own skating experiences. We hope that you will find judging a rewarding and enjoyable process that will inspire you to continue your involvement with the sport in the coming months and years. Skate Canada would like to thank you for volunteering your time and making an important contribution to our sport where skaters participate for fun, fitness, and/or achievement. The goal of the STAR 1-4 judge seminar is to prepare prospective judges to serve as contributing members of STAR 1-4 event judging panels with confidence and success. The materials covered in this manual along with the discussions and activities in your seminar will prepare you to judge your first STAR event and provide you with a solid knowledge base upon which you can continue to build and grow your judging abilities. Throughout this manual and training seminar, you will see references to STAR 1-4 as well as STAR 5. While STAR 5 is outside the scope of this clinic, at times it will be referenced to provide new judges with an overview of the entire STAR program. We hope that you will be inspired and encouraged to continue with STAR judging and perhaps continue on to pursue judging at higher levels within Skate Canada. Officials are valued members of Skate Canada who donate their time, knowledge and expertise to assist in the development of our athletes. In figure skating, there are many different categories and types of officials, each with a specific job to do. In the sport of figure skating all officials are volunteers who are involved in skating because of their love of the sport and to assist in the development of both skaters and skating in this country. Their reward is to see skaters grow and improve throughout the years. Officials can provide their expertise in various capacities within the organization, for example, by officiating at test days and events, monitoring skaters and leading clinics. The event side of officiating is the focus of this training. An event official is an individual who helps to determine the results of figure skating competitions in Canada. These officials are: judges, referees, technical officials and data specialists. In STAR 1-4, events are judged by a STAR panel consisting of three STAR judges. They work as a team to identify elements and assess the quality of these elements at the same time. The STAR judging panel functions as a combination of a judging panel and a technical panel. Who Can Become a STAR 1-4 Judge? 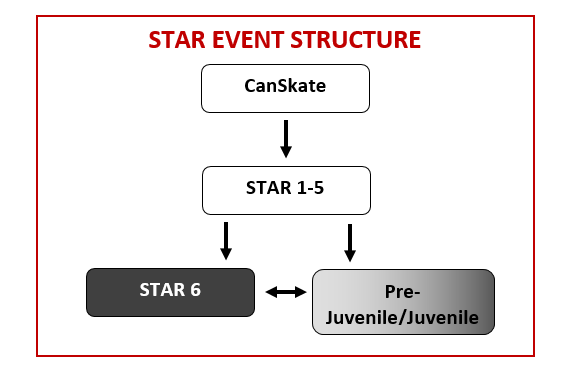 How does the STAR 1-5 event system fit into Skate Canada programming? Sport Canada has mandated all Canadian amateur sport organizations to revise their programming to reflect their athlete development research findings and align with LTAD philosophies. This model provides a pathway for an athlete to progress successfully through each sport. Skaters in STAR 1-4 will be assessed against a standard for each element and program component. The following table describes the correlation between the assessment standards of Gold, Silver, Bronze and Merit with the expected level of development of skaters. Judges always need to keep in mind that the expected level of development is different for each level of STAR. 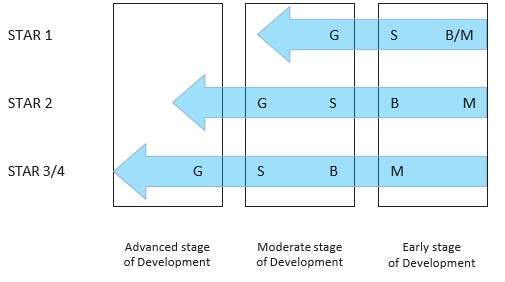 The expected level of development for a STAR 4 skater is much higher than a STAR 2 skater, for example. The same single Salchow performed in a STAR 2 and a STAR 4 event would not necessarily receive the same rating. This element might meet the standard for a Gold in STAR 2, but might only meet the standard for a Silver in STAR 4 as the skater has a higher expected level of development. Skaters in STAR 5 are no longer assessed against a standard as in STAR 1-4. In STAR 5, skaters will be ranked within their groups and will be judged using the Cumulative Points Calculation (CPC) system. Technical Panel: Identifies elements and determines the difficulty level of certain elements (also identifies falls and bonuses as applicable). Judging Panel: Assigns quality marks to each element (Grades of Execution or GOEs) (also applies deductions as applicable). The judging panel also assigns program component scores for five aspects of a skater’s program. 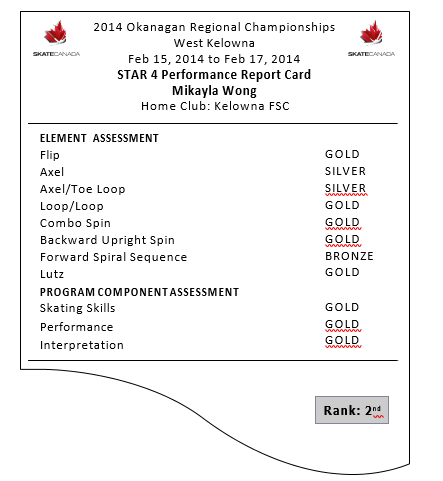 Each STAR judge must be able to correctly identify all the elements executed by skaters in STAR 1-4. Become familiar with the marking sheet. Know where to record information so that time is not spent looking on the sheet instead of looking at the skater. Know the element codes and have a system of shorthand developed to record information quickly. Write with a pencil to prevent smudging and so that errors can be erased if needed. Have multiple pencils available in case they break. Reach a quick decision at the end of each program by recording useful information during the performance (i.e. keywords or symbols that correspond to the assessment criteria - Good, Weak, Strong, Lacking). While each judge may have their own preferred way of recording information about an element, the Official Marking Sheet that is submitted to the data specialists must contain the official element codes. Note: Judges must only write the attempted elements as the Executed Element using the codes listed above. Rotation and edge symbols (i.e. <, << or ‘e’, ‘!’) cannot be entered into the system in STAR 1-4. The only exception to this is the Axel in STAR 4; it may receive the sign <<. Here are some ideas on how a judge can record WHAT each skater performs, as well as ways to capture HOW WELL the skater has performed each element or program component. Lacks speed, edges not smooth – scratchy at times. Step 3: Understand the expectations for each STAR level and accurately assess the quality of skating in relation to the level of the skater. In general, good quality skating or elements will be rewarded with higher scores than skating or elements executed with poor quality. Skating skills are the fundamental building blocks upon which all skating is based. In the STAR 1-4 system, judges will see skaters who have learned “how to skate” and are progressing into figure skating as a sport. In the STAR 1-4 system, skaters will build on these areas as they continue to develop. There is an expectation, therefore, that skating skills will improve skaters’ progress from STAR 1 to STAR 4. Technique refers to how a skater uses his/her skating ability to move across the ice. In assessing technique, judges determine whether a skater has demonstrated the proper skating mechanics. A skater who uses proper technique should be rewarded with a higher Skating Skills assessment than a skater who uses weak or improper technique. Does the skater push correctly from the side of the blade? Is the strength of the thrust approximately the same from each foot? Is the knee action soft and consistent? Is the posture upright or does it break at the hips with each stroke? Does the skater have sufficient control? Is the stroking powerful in relation to the skater’s body composition? Does the skater maintain speed throughout the program or is it limited to small sections in the program? Does the skater generate speed only during crosscuts or is he/she able to generate speed coming out of elements? Execution encompasses control of edges, body lean and balance. 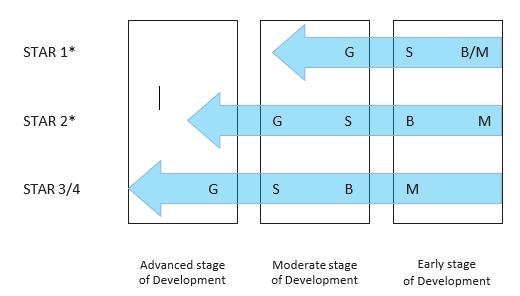 Edges are the fundamental building blocks for skill development in skating. Judges should assess whether a skater demonstrates control on clean, defined edges. Do edges or flats predominate in the performance? Does the skater show smooth control of the edge? Is the edge noisy or quiet? Are a skater’s edges sure or are there wobbles, e. losses of control? Body Lean enables a skater to generate depth of edge. Does the skater establish the lean of the edge from the push-off? Does the skater maintain the correct lean for the duration of the edge? Does the skater change lean easily from one edge to the next? Balance is the ability of a skater to remain in control of edges and body lean. Does the skater demonstrate good balance by being able to glide? Does the skater maintain balance while stroking? Does the skater demonstrate balance while executing turns? Is the transition from one foot to the other controlled and smooth? Does the skater step solidly onto the new skating foot? *Although STAR 1 is not assessed in Skating Skills, development in this area is still taking place. Performance is the aspect of a skater’s program that combines ability to perform with reasonably correct and pleasing positions. Does the skater look up while skating or are the eyes focused downwards towards the ice? Is the skater committed to the movements within the program? Does the skater skate with a sense of confidence that the judges and audience can feel during the performance? Does the energy in a skater’s performance stay the same throughout or does it fade after the first 10 seconds as the focus turns to executing the elements? Does the energy level in a skater’s performance diminish when errors occur? *Although STAR 1 is not assessed in Performance, development in this area is still taking place. Does the skater change the pace of movement to correspond to changes in pace of the music? If there was no music playing, could someone tell by watching the skater when the music switched from fast to slow or vice versa? If the music is a Tango or is Spanish, are the movements sharp and/or quick? If the music is soft and flowing, are soft and flowing arm movements included? If the music is fun and playful, is this reflected in the movements? If the music is rock and roll, are related movements included? *Although STAR 1 and STAR 2 are not assessed in Interpretation, development in this area is still taking place. A well-executed jump should have full rotation completed in the air and should not have any rotation completed on the ice. Judges must consider whether a jump has full rotation or has less than full rotation when making assessments. A jump that has more than ¼, but less than ½ of its revolutions completed on the ice is considered under- rotated (<). A jump that has ½ or more of its revolutions completed on the ice is considered down-graded (<<). Please refer to the Assessment Criteria in the current STAR Competition Program Requirements for details on the expectations for rotation at each STAR level. 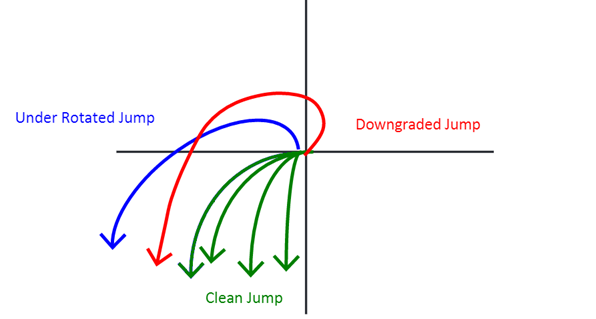 Execution refers to the overall quality of each jump element. Several considerations must be considered when assessing execution including the level of a skater. Is the jump approached with speed, a strong position and a strong edge? Is the entry edge a constant radius with consistent speed? Does the jump lift off the ice with ease? Is the take-off edge clean? Does the jump have good height and distance? Does the jump convert to a proper back-spin position? Is the body carriage/line straight in the air? Are all body positions controlled throughout the flight? 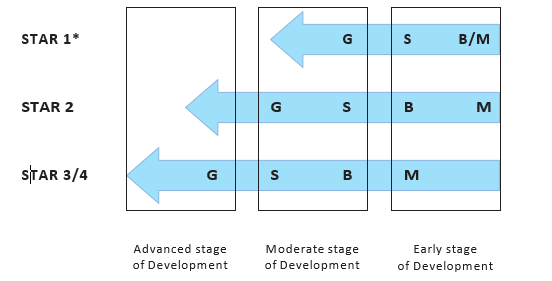 Judges are reminded that, similar to the Stages of Development in program component development, there are also different technical expectations of skaters in the different STAR levels. The expectations for ratings at each STAR level must be considered in relation to the level of the skater. This means that the expectation for “good height and distance” on a jump executed by a STAR 4 skater will be higher than what is expected from a STAR 1 or 2 skater. Please refer to the Assessment Criteria in the current STAR Competition Program Requirements for details on the expectations for execution at each STAR level. Judges must also consider the landing phase of each executed jump. Does the landing carry flow? Is the landing on a clean, smooth edge? Is the landing arc equal to the take-off edge arc? Is the landing position held with good form? The length and position on the landing of a jump indicates the degree of control that a skater has over this last phase of the element. The expectations for each rating at each STAR level must be considered in relation to the level of the skater. This means that the expectation for “good form” on a jump landing for a STAR 4 skater will be higher than what is expected from a STAR 1 or 2 skater. Please refer to the Assessment Criteria in the current STAR Competition Program Requirements for details on the expectations for landings at each STAR level. Skaters will be assessed on the quality of the spinning position within the spins that are included in an element or program. Counting of revolutions should begin from the point where a skater reaches the position. Attempted position: The skater’s spinning position does not meet the definition of a basic position. Upright Spin – Any position with extended or slightly bent skating leg that is not a camel position. Sit Spin – The upper part of the skating leg is at least parallel to the ice. Camel Spin – Free leg backwards with the knee higher than hip level. The expectations for each rating at each STAR level must be considered in relation to the level of the skater. This means that the expectation for ‘good body line’ in a spin position for a STAR 4 skater will be higher than what is expected from a STAR 1 or 2 skater. Please refer to the Assessment Criteria in the current STAR Competition Program Requirements for details on the expectations for position quality at each STAR level. Edge quality can be observed and assessed in all spins, and is of particular importance on the completion of the Backward Upright Spin. It is expected that skaters will attempt to spin on the correct edges in all of their spins. The expectations for each rating at each STAR level must be considered in relation to the level of the skater. This means that the expectation for “good edge quality” in a spin for a STAR 4 skater will be higher than what is expected from a STAR 1 or 2 skater. Please refer to the Assessment Criteria in the current STAR Competition Program Requirements for details on the expectations for edge quality at each of the STAR levels. Judges must consider the quality of the execution in each phase of the spin elements. Is the spin approached with speed and strong carriage? Is the speed on entry appropriate and controlled? Does the spiraling edge convert quickly to the ball of the foot? Is the spin position strong and controlled? Is the rotation fast and well-centered? Does the spin increase, maintain or decrease in speed? Is the termination of rotation well-controlled with good body position? The expectations for each rating at each STAR level must be considered in relation to the level of the skater. This means that the expectation for “good execution” for a STAR 4 skater will be higher than what is expected from a STAR 1 or 2 skater. 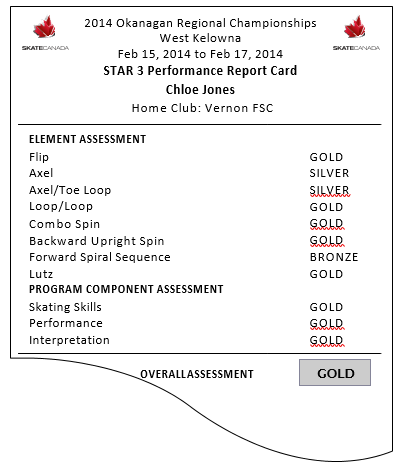 Please refer to the Assessment Criteria in the current STAR Competition Program Requirements for details on the expectations for spin execution at each STAR level. Each skater in STAR 1 to 4 must complete a spiral circle exercise or spiral sequence within the elements or program. Does the skater achieve a full spiral position? 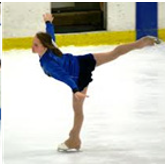 Does the skater have pleasing body lines in the spiral position? 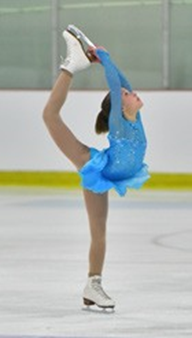 The definition of a spiral: A sustained edge with the free leg above the level of the skating hip. The expectations for each rating at each STAR level must be considered in relation to the level of the skater. This means that the expectation for “good lines and flexibility” for a STAR 4 skater will be higher than what is expected from a STAR 1 or 2 skater. Please refer to the Assessment Criteria in the current STAR Competition Program Requirements for details on the expectations for spiral position quality at each STAR level. 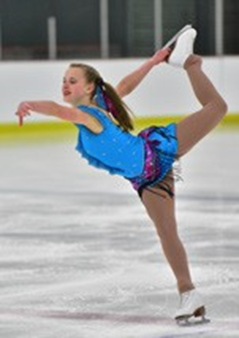 Judges must be able to determine the length of time that the skater holds a spiral in the required basic position. The expectations for each rating at each STAR level must be considered in relation to the level of the skater. This means that the expectation for duration of spirals for a STAR 4 skater will be higher than what is expected from a STAR 1 or 2 skater. Please refer to the Assessment Criteria in the current STAR Competition Program Requirements for details on the expectations for spiral duration at each STAR level. The expectations for each rating at each STAR level should be considered in relation to the level of the skater. This means that the expectation for ‘good execution’ for a STAR 4 skater will be higher than what is expected from a STAR 1 or 2 skater. Please refer to the Assessment Criteria in the current STAR Competition Program Requirements for details on the expectations for spiral execution at each STAR level. In STAR 2, each skater must complete a turn sequence element within the program. A turn sequence is a series of defined turns and steps. When assessing technique, a judge must determine whether a skater has demonstrated proper mechanics in a turn sequence. Is the strength of the thrust approximately the same on each foot? Are the turns executed on the correct edges? Are the crosscuts powerful in relation to the skater’s body composition? Does the skater demonstrate the ability to accelerate? Does the skater demonstrate stability? Are the edges sure or are there wobbles, i.e. losses of control? Is the transition from one foot to the other solid, controlled and smooth? Please refer to the Assessment Criteria in the current STAR Competition Program Requirements for details on the expectations for turn sequence at the STAR 2 level. A STAR 1 skater must complete a circle stroking exercise to receive an assessment on forward and backward stroking. When assessing technique, a judge must determine whether a skater has demonstrated proper stroking mechanics. Does the skater maintain speed throughout the circle stroking both forwards and backwards? Does the skater demonstrate balance while executing crosscuts? Please refer to the Assessment Criteria in the current STAR Competition Program Requirements for details on the expectations for circle stroking at the STAR 1 level. For a list of the most current technical requirements for STAR 1, please refer to the STAR Competition Program Requirements. For the most current STAR 1 Assessment Criteria, please refer to the STAR Competition Program Requirements. When assessing each element in STAR 1, judges will use a majority rule for determining the assessment standard. Each element has three Criteria for Assessment and the skater requires two out of three assessments at a level (or higher) to receive that assessment. For example, if two out of three assessments are at the Silver level or better, the element is assessed as a Silver. If any element has two assessment points rated as Merit, then the element must be rated as Merit. In STAR 1, the judges will work as a team that functions like a combination of a technical panel and a judging panel. As a group, they will identify and determine the assessment for each element. As each element is skated, if there is any disagreement or uncertainty about the rating provided by Judge 1, any of the judges may call ‘review’ (including Judge 1 if he/she wishes to discuss the element). Together, the three judges can have a quick discussion and determine the final assessment by reaching a majority agreement. In addition to the elements that STAR skaters must execute, STAR 1 skaters must also complete a Creative Expression Exercise. This introduces the concept of skating to music. To determine the final rating for each skater in a STAR 1 event, the data specialists will once again use a majority rule. They will look to find the majority of the seven ratings and this will determine the final assessment. A skater requires at least four ratings at a specific level (or any higher level) to receive the overall assessment. The Creative Expression Exercise is not considered in the ratings as it is only marked as Complete or Incomplete. However, if the Creative Expression Exercise is marked as an incomplete, the skater will receive an overall rating of Merit, regardless of the ratings achieved on their other elements. Example: Four of the seven assessments are rated as Silver or better, therefore, the skater is given an Overall Assessment of Silver. For a list of the most current technical requirements for STAR 2, please refer to the STAR Competition Program Requirements. They will also be assessed on two program components: Skating Skills and Performance. For the most current STAR 2 Assessment Criteria, please refer to the STAR Competition Program Requirements. 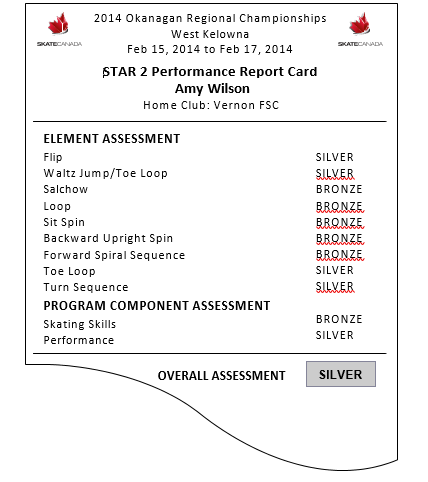 In STAR 2, judges shall use the Assessment Criteria chart to determine the assessments for jump, spin, spiral and turn sequence elements as well as program components. The assessment criteria chart contains detailed descriptions of different quality aspects that judges will observe in the elements and program components. Similar to STAR 1, each element and program component has two to three different assessment criteria that the judges need to consider when determining their assessments. Judges need to match the quality that they observe with these criteria in order to determine their assessments for the elements and program components. In STAR 2, each element and program component has required criteria. Ratings for each element and program component cannot exceed the rating for the required criteria. Remember: For the jump, spin, spiral and turn sequence elements, if a skater falls, the element does not necessarily receive an automatic Merit assessment. If there are positive qualities to the other two assessment criteria, then the element could still receive a Bronze rating. In STAR 2, the judges will work as a team as in STAR 1. As a group, they will identify and determine the assessment for each element and program component. Similar to programs skated using the full Cumulative Points Calculation (CPC) system, STAR 2 programs have element requirements that need to be filled. When skaters execute incorrect elements or elements exceeding what are permitted by the well-balanced program guidelines, these elements are marked as Invalid. An invalid element will not count towards the total element assessments. On each marking sheet, judges will find a small box with the list of required elements for STAR 2. This will help the panel quickly identify if the skater has indeed included the required elements, or if any incorrect or additional elements have been included in error. A skater must achieve at least seven assessments at a specific level in order to achieve that level as an Overall Assessment. There are also requirements for skaters to achieve in skating skills and performance to encourage well-rounded skaters and to focus on the basics of good quality skating. If a skater’s skating skills are assessed at Merit, then they will receive an overall assessment of Merit regardless of how the other elements are assessed. Example: Seven of the eleven assessments are Bronze or higher; therefore, the performance is assessed as Bronze. For a list of the most current technical requirements for STAR 3 and STAR 4, please refer to the STAR Competition Program Requirements. For the most current STAR 3 and STAR 4 Assessment Criteria, please refer to the STAR Competition Program Requirements. 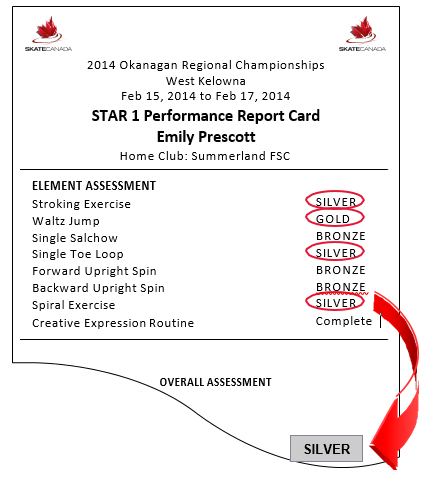 In STAR 3 and STAR 4, judges shall use the Assessment Criteria chart to determine the assessments for jump, spin and spiral elements as well as program components. The chart contains detailed descriptions of different quality aspects that judges will observe in the elements and program components. Similar to STAR 2, each element and program component has two to three different assessment criteria that the judges need to consider when determining their assessments. Judges need to match the quality that they observe with these criteria in order to determine their assessments for the elements and program components. In STAR 3/4 each element and program component also has required criteria. Ratings for each element and program component cannot exceed the rating for the required criteria. Remember: For the jump, spin and spiral elements, if a skater falls, the element does not necessarily receive an automatic Merit assessment. If there are positive qualities to the other two assessment criteria, then the element could still receive a Bronze rating. In STAR 3 and STAR 4 – the judges will work as a team as in STAR 2. As a group, they will identify and determine the assessment for each element and program component. Similar to programs skated using the full CPC system, STAR 3 and STAR 4 programs have element requirements that need to be filled. When skaters execute incorrect elements or elements exceeding what are permitted by the well-balanced program guidelines, these elements are marked as Invalid. An invalid element will not count towards the total element assessments. On each marking sheet, judges will find a small box with the list of required elements for STAR 3 and STAR 4. This will help the panel quickly identify if the skater has indeed included the required elements, or if any incorrect or additional elements have been included in error. In STAR 3, there are no specific bonuses or violations that will be applied. In STAR 3 and STAR 4, if a skater falls on an element, there is no specific deduction that will be taken. If a fall happens outside of an element, this will be considered in the Skating Skills mark. In STAR 4, however, for the first time, skaters may earn bonuses or be subject to violations. STAR 4 Bonus: 3-point bonus for each Axel that is successfully completed. Note: There can be a maximum of two Axels and they must be clean or under-rotated in order to receive a bonus. A downgraded Axel will not receive a bonus. However, a fully rotated Axel with a fall or an under-rotated Axel with a fall would both still receive a bonus. Timing Violation: A violation and a corresponding deduction of 0.2 will be applied for up to every five seconds that a skater’s program is lacking or is in excess of the specified time. Skaters are allowed to be ten seconds shorter or longer than the specified time, but any program length shorter or longer than these ten seconds will be considered a violation. Note: Programs must be timed using a stopwatch. The Referee shall begin timing when the skater begins to move and ends when the skater finishes the performance. Costume Violation: A violation and a corresponding deduction of 0.2 will be applied each time any part of a skater’s costume falls on the ice. If a skater’s Skating Skills are assessed at Merit, then he/she will receive an overall assessment of Merit regardless of how the other components at a higher level are assessed. Example: Eight of the 11 assessments are for Gold; therefore, the performance is assessed as Gold. This calculation process is repeated for all jump, spin and spiral elements as well as program components. While the results sheet for STAR 4 looks very similar to STAR 3, there is one key difference. Instead of receiving an overall assessment, the skater’s result sheet will show an overall group ranking as well as the individual element assessments. This will provide valuable feedback to the skater, coach and parents. Skate Canada officials must follow certain guidelines with respect to their conduct both on and off the judge’s stand. Below is a summary of the duties of Skate Canada judges. The complete Duties of Officials Policy can be found in the Association Policies and Procedures section of the Skate Canada Rule Book. General: Evaluators, judges, referees, technical controllers, technical specialists and data specialists are official representatives of the Association and should at all times conduct themselves in a manner befitting such an appointment. They shall also be held responsible for seeing that all rules of the Association are observed on any occasion where they are present. A Code of Ethics is a set of principles designed to help members of an organization understand the difference between ‘right’ and ‘wrong’ in the context of making decisions within the organization. Skate Canada has introduced a unified code of ethics. The purpose of Skate Canada’s Code of Ethics is to outline the organization’s expectations and guiding principles for appropriate decision making and behaviour. The code applies to all skaters, officials, coaches, employees, board members, volunteers, alumni, and hall of fame members of Skate Canada and its affiliate organizations. This code of ethics also applies to parents and guardians who participate in and observe related activities. While there is no formal skating background required for STAR 1-4 judges, having this background is definitely an asset to this role. All judges, even those with a skating background, must demonstrate general skating knowledge through the successful completion of an Element Identification Exercise to ensure that they are able to accurately and consistently identify skating elements. STAR judges must be consistent with their decision-making and ensure that their judgments are being made without bias, in good faith and are based on the standards and criteria that they have been taught in the STAR clinic. Bias is a prejudice in favour of or against one thing, person or group compared with another, usually in a way considered to be unfair. Judges who find themselves in situations where they feel their possibility for bias will be hard to overcome, or who may be concerned about the perception of bias by others, should speak up and ask for a different judging assignment if possible. Never awarding or supporting assessments based on past performance, reputation, crowd reaction, or performance in the warm-up. New STAR 1-4 judges will be meeting many people for the first time. This could be the first step in long careers as officials and they may develop long-lasting relationships with many individuals. However, even if officials do not stay in the sport for life, there are many reasons that building relationships is important for all STAR judges. How Does One Build Relationships? STAR judges must demonstrate good communication skills in their roles as officials, both with fellow officials and with all other skating stakeholders (skaters, coaches, event organizers, etc.). I can’t find the information on the website…it’s too hard to navigate versus would you be able to tell me where I can find that on the website? I didn’t see that under-rotation on the jump – versus – in my opinion that jump was fully rotated. Not questioning or communicating doubt about the decision to other individuals not on the panel. All STAR judges should remain open to the opinions of others and should be willing to learn from fellow judges to expand their knowledge of figure skating. Take responsibility for their own needs where possible at events (e.g., ensure that they know when meals are being served and eat when they have time). Demonstrate appropriate and professional attire, behaviour and conduct befitting a Skate Canada official throughout an entire event, both on-panel and off-panel. Ensure timely communication with fellow officials and organizing committees. Prompt and accurate replies to phone calls and e-mails assist in smooth planning of events. Declare all conflicts of interest or perceived conflicts of interest prior to accepting assignments (as outlined in Skate Canada Regulations). STAR judges are part of a team when acting on STAR panels. As such, they should strive to embrace the concept of teamwork and working together with a group of individuals to the betterment of the sport. STAR judges should remember to maintain a positive spirit of enthusiasm and cooperativeness throughout a competition. STAR judges are encouraged to react in a flexible and good-humoured way when these kinds of situations occur and the event changes unexpectedly. Ensuring that the warm-up is timed properly: Referees should have a stopwatch to ensure that the music technicians are providing the correct amount of time for the event warm-up. Monitor warm-up: Referees should observe the warm-up for any incidents that might occur (e.g. injury) and act accordingly. In the case of a serious injury (e.g. potential concussion) referee may need to clear the ice and arrange for medical attention (e.g. coach or other medical if available at event). Setting the pace of the event: In many cases at STAR events, there will be minimal time allowed between skaters. This means that the referee must keep the event moving by ensuring that an efficient dialogue is happening between judges. The referee must be aware of when the event started and of how much time is allowed for this event. If the referee feels that the panel is spending too much time discussing assessments, he/she must politely inform them of this and if necessary, assist in moving things along. If the referee feels that the announcer is moving too quickly or too slowly, he/she can politely arrange a signal with the announcer that can be used by the referee to denote when it is time to proceed with the next skater. If the competitor informs the referee within thirty seconds of the start of the music that the tempo or quality of the music is deficient, the skater may restart the program from the beginning. There is no deduction in STAR 2, 3 or 4 in this situation. When an interruption, a stop in the music or any other adverse condition unrelated to the competitor’s equipment occurs, such as lighting problems, poor ice conditions, etc., the referee shall blow a whistle to signal the competitor(s) to stop The competitor(s) shall continue from the point of interruption immediately after the problem has been solved. If, however, the interruption lasts longer than 10 minutes, the referee should grant a second warm-up period for the skaters within the affected warm-up group that have not yet skated (as outlined in Skate Canada Regulations). There is no deduction in STAR 2, 3 or 4 in this situation. If a competitor becomes injured during a performance, experiences a flare-up of a health problem or encounters an adverse condition related to equipment, such as unexpected damage to clothing that impedes skating, the Referee must decide at which point this situation poses a safety risk to the skater and must then blow a whistle to signal to the skater to stop There is no deduction in STAR 2, 3 or 4 in this situation. If the adverse condition can be remedied without delay, the competitor(s) shall immediately continue from the point of interruption. There is no deduction in STAR 2, 3 or 4 in this situation. If a remedy is not possible without delay, the referee will allow a period of up to three minutes for the competitor to resume skating from the point of This time period commences immediately after the competitor stops skating or is ordered to do so by the referee, whichever is earlier. If the skater cannot continue the performance, he/she is considered to be withdrawn. Referees should remember that above all, the priority in STAR is for skaters to participate and have a positive experience. These suggested procedures are based on Skate Canada Rules and Regulations but do not describe every possible scenario that a referee may encounter in a STAR event. Referees are reminded to always exercise their discretion and good judgment and to consider the best interests of the skaters in all situations. Once the STAR clinic has been completed successfully and an official is qualified to judge at STAR events, he/she must be familiar with the procedures of these events. Technical representatives (tech reps) are responsible for creating the event and the judging schedules. They are usually also responsible for recruiting judges. Most events will require officials to register at a registration They will then be provided with an accreditation tag that will give them access to the judges’ room and the judging stand. Time should be taken to locate areas of importance, such as where meals will be eaten, washrooms, location of judges’ stand, etc. Judge 1/the referee should ensure that he/she has a stopwatch available (cell phones should not be used for timing). As officials prepare to leave the arena, they must remember that coaches occasionally wish to talk to the members of the judging panel to help them further the development of particular skaters. Judges can play a key role in encouraging and educating all members of the skating community. Discussions of this nature should take place between a Skate Canada coach and a Skate Canada official. While the coach may wish that a parent and/or a skater could be present for the discussion, officials should only discuss event results with a coach. This avoids misunderstandings or difficult discussions particularly if a parent does not have a skating background, and therefore the technical knowledge, needed to have a productive feedback discussions. Questions about the identification or assessment of an element should be directed to Judge 2 or Judge 3, who would have the notes on the identifications/assessments. Officials should always provide constructive feedback and should never share or make comments that are hurtful or overly harsh. It is important to remember that these skaters are at the beginning of their development and expectations and any feedback provided by STAR judges must match the developmental expectations of each STAR level. Once the positive assessment form is received, here are a few things to know about moving forward. You must be a registrant or member of Skate Canada to receive your STAR 1-4 judging promotion (registration is completed through a Skate Canada club or skating school). Once you have received your promotion you will be placed on the list of STAR 1-4 judges in your section or area. You may begin to receive e-mails or phone calls from tech reps asking you to judge at a competition. Remember all of your training regarding prompt and accurate replies and commitments! Each role on the STAR panel has specific duties and you may feel more comfortable in one role over another. Although you have been given the necessary tools and training to be successful in all three panel positions, you may communicate your preference to the tech rep (with no guarantee they will be able to accommodate all requests). Note: It is recommended that STAR judges gain experience officiating as Judge 2 or Judge 3 for a minimum of two STAR groups/flights (STAR 2, 3 or 4) before being assigned to the role of Judge 1 on a STAR panel. Some judges may enjoy judging as a STAR 1-4 judge for quite a while. Others may be curious and interested in progressing as a judge to officiate at STAR 5, STARSkate or Competitive events such as Pre-Juvenile and Juvenile. To progress to being a STAR 5 and higher judge, you must attend further training. You should speak to your Section Judge/Evaluator Chair if you are interested in progressing. They are usually offered one to two times per year in each section. To progress as a technical official, there is a separate training seminar for technical officials that sections may offer as well. When and how often this training is offered is normally based on the need for technical officials as well as the number of people interested, so once again you should speak to your Section Judge/Evaluator Chair or Section Technical Officials Chair for more information. Finally, one way to be involved at higher-level competitions before you have any additional promotions is to volunteer as a data input operator or video replay operator. Speak to your Section Judge/Evaluator chair about the opportunity to be trained in these areas. A recommendation for appointment requires a “Yes” on items 1 and 2, and a “Meets expectations” on items 3 and 4. Remains open and adaptable to changes in schedule, groups, etc. This checklist has been developed to assist Referees when Refereeing STAR 1-4 events. Referees should remember that above all the priority in STAR is for skaters to participate and have a positive experience. The suggested procedures below are based on Skate Canada Rules and Regulations but do not describe every possible scenario a Referee may encounter in a STAR event. Referees are reminded to always exercise their discretion and good judgment and to consider the best interest of the skater in all situations. Ask Ice Captain to confirm is skater has registered. If the skater cannot be located and the event is running on-time or late, you can go ahead with the warm-up. If the event is running early, you should wait until the scheduled start time to begin the warm-up. If the skater is located during the warm-up they may join the warm-up in progress but are not awarded additional time. If the skater is located after the warm-up has been completed, you may elect to move them to a later group of the same event (i.e. they would skate in STAR 3 Group #2 instead of STAR 3 Group #1. Inform the data specialists of this change. If there is no later scheduled group of the same event, the skater must choose to compete without a warm-up or withdraw from the event. Do a roll call with the skaters and identify the extra or missing. If a skater is missing, speak to the Ice Captain to request they locate the skater. If a skater is missing, allow the warm-up to continue and follow the same steps as above to locate the skater and determine a course of action. Warm-up Time the warm-up according to the STAR Event Management Guide. You should begin timing once all skaters have taken the ice. You should also ensure the announcers announce ‘one minute remaining in warm-up’. Skater may leave ice to be assessed. It is important to keep the event moving as efficiently as possible without rushing the panel or allowing too much discussion. You should consult the schedule to know how much time has been allocated to the event, and even ask the Tech Rep how much time they have allowed in between each This will give you a sense of the required pace of the event. In this situation, have the Ice Captain inform the next scheduled skater that they are going to be skating Allow a moment or two for this skater to be located and/or to get organized and then have them announced. If another copy of the music cannot be located the skater can choose to skate to another skater’s music. In this case you would select another skater’s music from the flight and play this for the You may wish to check with the coach what the length of the program was planned to be in order to select an appropriate program length. As a reminder, there are no timing deductions in STAR 2 or STAR 3 if a skater’s program is too long or too short. If a skater does not wish to do this, their only other option is to withdraw. A skater has to skate to music. It is discouraged to allow skaters to change groups at this point. There is no deduction or penalty for a fresh start at any STAR level. Note: If the skater repeats any elements, only the first attempt shall be considered in the panel’s assessments. Performance A skater becomes injured or another adverse condition related to his or her equipment (such as health problems or unexpected damage to clothing or equipment) impedes his or her skating. The Referee must decide the point at which the skater requires assistance or the situation poses a safety risk to the skater and blow their whistle to signal to the skater to stop skating. The Referee should take note of the approximate time in the program where the interruption took place. If the adverse condition can be remedied without delay, the competitor(s) shall immediately continue from the point of interruption. Call the skater over to let them know where they are to begin the program. Speak to the Music Technicians to request they back up the program music to the approximate point of interruption. Speak to the judging panel to inform them of where the skater is to begin again. There is no interruption deduction applied in STAR 2, 3 or 4 when this situation occurs. If a remedy is not possible without delay, the referee will allow a period of up to three minutes for the competitor to resume skating from the point of interruption. This time period commences immediately after the competitor stops skating or they are signaled to do so by the referee, whichever is earlier. If at the end of the three minutes they cannot continue their performance, they are to be considered withdrawn.